New York - Former House Speaker Newt Gingrich on Monday compared the mosque planned to go up blocks away from ground zero in New York to Nazis protesting next to the Holocaust museum. “Nazis don’t have the right to put up a sign next to the Holocaust museum in Washington,” Gingrich insisted, speaking of the museum where just a year ago a guard was killed by a white supremacist trying to enter the building with a gun. Wow! There are still politicians with brains in their heads. He's not belittling Islam, he's belittling the holocaust. 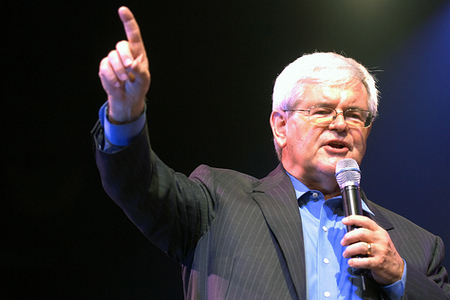 Hopefully we will see Mr. Gingrich run for the White House in 2012. He is a wise conservative, an outspoken ally of Israel and has always supported Jewish values. Additionally he has what it takes to put this country back on the right track. How about a memorial for Timothy McVey at the FBI building in Oklahoma! People have to be very careful about how we react to the mosque and the words we use to compare them to Nazis. American Muslims are very well integrated into our society and we should not make them feel like 2nd class citizens. By reacting like the right-wing leaders have, we will only encourage MORE young Muslims to feel unwelcome, and hated. Let's not play into radical imams hands by alienating normal Muslim Americans. Ground zero mosque is not the only mosque that people object. Sheepshed Bay, Staten Island and Bay Ridge residents all protest building mosques in their neighborhoods. At some point we have to stop this crazy diatribe against all Muslim communities in the U.S. We are only creating more future terrorists by overreacting like this. What you're saying makes a lot of sense, but can you blame Americans for that. "Not all Muslims are terrorists, but all the terrorists were Muslims"
When I first heard of the plans for the mosque, and of the emotions it evoked, I immediately drew a paralel to the hypothesis of a Libyan consulate being built on or near the site of where the Pan-Am plane went down in Lockerbie, Scotland. The outcry would undoubtedly be enormous. #9. Sometimes I think there is a finite number of points that liberals can memorize, so they keep applying them in all their arguments. One of those points is that muslims commit their beastly acts because they were not "welcome". Gingrich makes a stupid argument. Xians (specifically) have slaughtered millions of Muslims through the years. Yet you don't see them blocking churches from being built in Jordan. He again shows himself to be a stupid man. Mr Gingrich should be aware that his fellow xians have built plenty of churches on top of Jewish graves after slaughtering all the Jews. On the old Jewish cemetery in Pacanow the CHURCH built a warehouse. On the cemetery between Pacanow and Stopnica they put up a giant tzelem and a huge church.... right on top of the graves of the people they slaughtered! Mr. Gingrich is, himself, a supporter of (or minimally ambivalent to) the very practice he claims to be against here. History shows us that there are those react out of emotion and without logic or facts. THAT kind of thinking led the Germans down their path. Hatred and extreme emotion will do that. We are a nation of fundamental RIGHTS and LAWS to uphold them. One of which is religious freedom. “ Gingrich makes a stupid argument. Xians (specifically) have slaughtered millions of Muslims through the years. Yet you don't see them blocking churches from being built in Jordan. He again shows himself to be a stupid man. Thank you for speaking sense on this site. This remark is just plain stupid. Nazi represents elimination of Jews. The Muslim religion is a legitimate religion and their people have every right to build wherever they want. Everybody understands that it's an emotional issue, and the leaders should be encouraged to go somewhere else but we cannot refuse them since we are a free country. I wondered what PMO means. Based on your recent posts it is pretty obvious. Your support of the cultural center being built by a Hamas supporter with arguments that do not even rise to the level of weak is now understood. Do you wonder were funds for this building are coming from? They should be required to report that just like all exempt organizations must report their sources of support. It would make sense to know this beforehand rather then after it is built with money from terrorists. The bigger issue is why would they build it in that particular area when it is so offensive to so many. And the offense is specifically building in the shadow of the WTC. There is no question that is part of the reason why they want to build there. Is their right to offend, using possibly tainted money stronger then the public's right not to be abused? I hardly think so. If this was truly a peace loving organization they would never considered building there. Yes like the ones that Attacked the USS Liberty, in International water. We know who the terrorists are, and there days are numbered. “ I wondered what PMO means. Based on your recent posts it is pretty obvious. I am not defending the building of the Mosque. I'm defending their Constitutional right to do it. This mosque has been operating in that neighborhood for decades... just 2 blocks away. They aren't moving into the neighborhood... they've been there since the "60's. Is there anything in any of their previous fundraising that leads anyone to believe there is a sinister connection here? Nope. Nobody has found anything. They are not required to give you one shred of information before they disclose their books to Uncle Sam. Secondly, the idea that you feel the public is "abused" is ridiculous. You have to show material harm to the public. There is none. At one time, a black man marrying a white woman was considered by a judge to be a "shock to the conscience". Over 70% of America believed that mixing races was both against the "bible" and should remain against the law. Obviously, smarter men than those representing the masses came to the senses. The same holds true here. It doesn't matter what you think, or what I think. The founders of this country gave every man here rights. When you strip away unconditional rights from one, you strip away from all! #20 Says:.... again your comments go in two different directions. The last two lines of your post calling those who attacked the USS Liberty terrorists are very interesting. My take on what you are saying is that Israel committed a terrorist act in what is believed to be a tragic accident/mistake during the June 1967 war. No, the founders of this nation expected exactly what we have. It is a government for and by the people. We ELECT people to represent our interests and uphold and defend the freedoms that are guaranteed to us. THAT is the foundation. It has nothing to do with liberalism or conservatism. I can only count one specific instance in recent history where that core was shaken, and it was the passing of the Patriot Act, which gave the Federal Government the right to search and seize property without a warrant under the guise of "national security". The 4th Amendment has been forever compromised in the most horrific of ways. Beyond that, our core founding principles are intact. You may not like the policies of the Obama Administration (I know I don't), and you may not like what Congress is up to either (again, I know I don't), but it is the government we elected fairly. These freedoms which you are so quick to dismiss have stood the test of time through wars overseas and on US soil. They have stood strong through depressions and times of great prosperity. There is no reason we should EVER bend them. History shows us that they withstand any threat and any enemy. Have faith. Why are we being blinded??? It is so simple- 1- why don't they want to move to state owned land? 2-why are they not letting us know where there moneys coming from? 2 strong argument points!!! Maybe according to law they have freedom of religion, but If this building is built, americans are gonna be building a huge church over were this mosque is going to be built!!!! Maybe you should stop taking the Christian american viewpoint hook-line-and sinker. thomas Jefferson is not rolling in his grave considering that he too didn't believe in god. In fact, TJ created his own bible in which he cut out all mentions of god! In fact TJ believed he should take te deism and ethics of the Jews and "show in what a degraded state they were."